I'm pretty much always willing to try anything once—and that attitude carries itself over into my skincare routine. I'm passionate about maintaining youthful-looking skin, so why not test out whatever products and tools I can get my hands on? This time, I decided to experiment with my freshly formed crow's-feet. They're a sign of experience and laughter, sure, but I'd rather my wisdom not show up on my face, thank you very much. 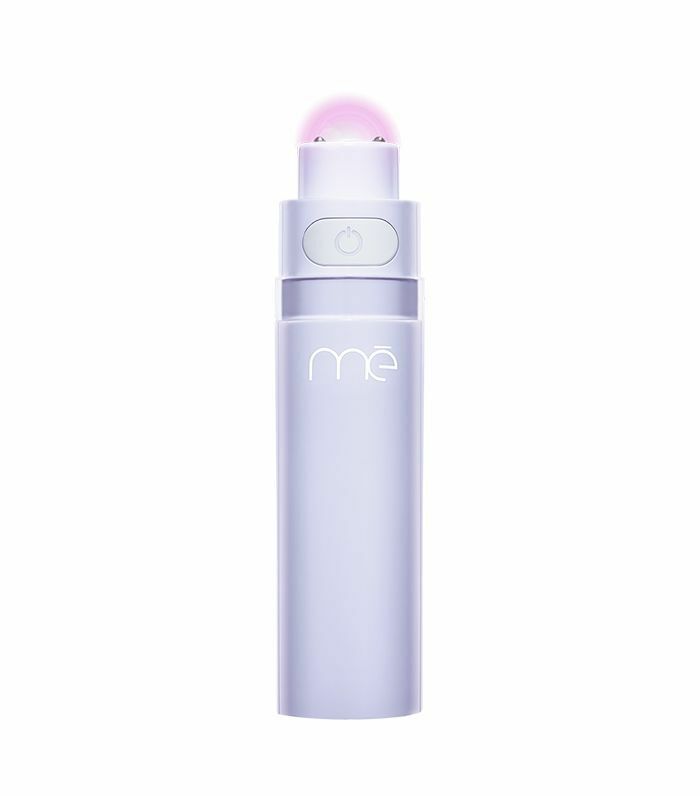 So when I read about Iluminage's Me Bright Eye Illuminating Device ($129), a tool that claims to "fight the appearance of under-eye circles, lines, and puffiness as well as boost collagen production for brighter, livelier eyes and smoother, younger-looking skin," I had to try it. Boasting a one-week turnaround is a tall order, but if it worked, I'd be just about the happiest wrinkle-free woman on the planet. Keep reading to find out the results. Below is a photo that was taken of me before using the device. My crow's-feet aren't terrible, but they certainly exist. Not to mention, I've been plagued by under-eye circles and bags my entire life and would love to zap those away as well. So let's get started, shall we? The tool features a unique combination of radio frequency, red LED light, and gentle vibration to stimulate the production of collagen and elastin in your skin. As instructed, I began to glide the device over my eye area with a good amount of pressure for three minutes. It felt slightly warm but completely comfortable—soothing, even. After treating each eye, I did notice a slightly plumper look around my under-eyes, but my crow's-feet were still going strong. I did this every day for seven days (74% of those tested saw improved hydration in just one week), and I can truthfully say it did help but didn't do much for the wrinkles around my eyes. I decided to keep the experiment going because 93% of participants in that same trial saw fine lines disappear in just eight weeks. It was a test of my patience, for sure, but as I said earlier, I'm willing to give anything a go. Now, on the other side of two months, I can confidently say I've noticed a difference. It's nothing drastic, but to be able to comfortably and painlessly treat your wrinkles for just six minutes a night and see any results is a feat. To maintain the results, I've kept it up by treating each eye two to three days a week, and I'm pleasantly surprised. The tone and texture of the skin around my eyes have improved, and the wrinkles have been kept mostly at bay (which is exciting, as I was considering fillers and Botox). What are some of your favorite anti-aging devices? Let us know in the comments below.